The Micro True Wireless Earbuds and Power Case are the latest in bluetooth earbuds. There is no wire connecting these earbuds, making these truly wireless. 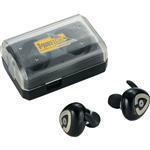 Earbuds come with a compact carrying case, which doubles as a charging station. Pre-charge the case for a portable charger. 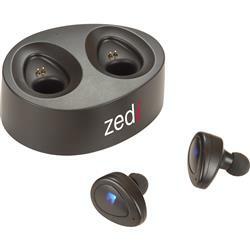 When fully charged the carrying cases can recharge your earbuds from 0 to 100% two times. 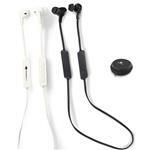 These earbuds allow for over two hours of playback time, making them a must have for the frequent travelers. 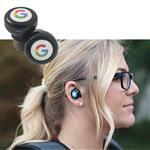 The earbud design easily keeps them in place on the go. Bluetooth has a range of 10 meters (33 feet). Includes charging cables and small/medium ear tips. Charging time is .5 hours for the earbuds and 2 hours for the case. 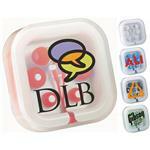 Customize with your logo and create the perfect executive gift! Bluetooth Earbuds, no wire connecting the earbuds. Charging time is .5hrs for the earbuds and 2hrs. for the case.